Sudeley Castle is located in the Cotswolds near Winchcombe, Gloucestershire, England. The present structure was built in the 15th century and may have been on the site of a 12th-century castle. The castle has a notable garden, which is designed and maintained to a very high standard. The chapel, St. Mary's Sudeley, is the burial place of Queen Catherine Parr (1512–1548), the sixth wife of King Henry VIII, and contains her marble tomb. Unusually for a castle chapel, St Mary's of Sudeley is part of the local parish of the Church of England. Sudeley is also one of the few castles left in England that is still a residence. As a result, the castle is only open to visitors on specific dates, and private family quarters are closed to the public. It is a Grade I listed building, and recognised as an internationally important structure. A castle may have been built on the site during the reign of King Stephen (1135–1154). In 1442, Ralph Boteler, who was created Baron Sudeley by King Henry VI of England, inherited Sudeley Castle and built the current castle on its present site, using what he had earned fighting in the Hundred Years' War. He built quarters for servants and men at arms on the double courtyard that was surrounded by a moat. He also added state and family apartments on the second courtyard. The Chapel, which would become St. Mary's, and the tithe barn were also built under Boteler. Unfortunately, Boteler failed to gain royal permission to crenellate the castle, and had to seek King Henry VI's pardon. Due to his support for the Lancastrian cause, King Edward IV of England confiscated the castle from Boteler in 1469, and gave it to his brother, Richard Plantagenet, Duke of Gloucester, who later became King Richard III of England. Richard used the castle as a base for the Battle of Tewkesbury. He later exchanged this property for Richmond Castle, making Sudeley property of the crown. Ownership of the castle returned to Richard when he became king in 1483. During his reign, the Banqueting Hall, with oriel windows, and the adjoining state rooms, now in ruins, were built in place of the eastern range of Boteler's inner court as part of a royal suite. After King Richard's death at the Battle of Bosworth, Sudeley passed to the new king, Henry VII of England, who then gave it to his uncle, Jasper Tudor, Duke of Bedford. By the time King Henry VIII of England succeeded to the throne, the castle was the property of the Crown again. In 1535, King Henry VIII and his second wife, Queen Anne Boleyn, visited the castle, which had been empty and unattended for some time. When King Henry VIII died, the castle became the property of his son, King Edward VI of England, who gave it to his uncle, Thomas Seymour, whom he made Baron of Sudeley. In early Spring 1547, Lord Seymour married King Edward's stepmother, the Dowager Queen Catherine Parr. At the announcement of her pregnancy in late 1547, Seymour began to renovate the castle for Catherine's use, but only one room that he built remains today. Lord Seymour and Catherine decided that she should move to Sudeley for the final months of her pregnancy. At about six months, Catherine was accompanied by Lady Jane Grey and a large retinue of ladies to attend on her, as well as over one hundred gentlemen of the household and Yeomen of the guard. Catherine's sister Anne, Countess of Pembroke, also came and attended upon her as her chief lady and groom of the stool. Catherine gave birth to her daughter, Lady Mary Seymour, on 30 August 1548, only to die on 5 September of that year. She was buried in the Chapel. Her grave was later discovered in 1782, after the castle and the chapel had been left in ruins by the English Civil War. She was later reinterred by the Rector of Sudeley in 1817, and an elaborate tomb was erected in her honour. 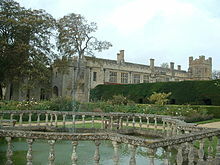 In 1549, Lord Seymour's ambitions led him to be arrested and beheaded; after which, Sudeley Castle became the property of Catherine's brother, William Parr, 1st Marquess of Northampton. After Parr's involvement with the plot to put Lady Jane Grey on the throne, he was stripped of his property and title by Queen Mary I of England. Parr would regain his titles later on under Queen Elizabeth I of England, but the Castle remained property of the Crown. In 1554, Queen Mary I gave Sudeley Castle to John Brydges, 1st Baron Chandos, and it remained his property throughout her reign and the reign of Queen Elizabeth I as well. It was at Sudeley that Queen Elizabeth was entertained three times. Also, a spectacular three-day feast was held there to celebrate the anniversary of the defeat of the Spanish Armada in 1592. He is buried in the chapel, as well, as was Giles Brugge, 6th Baron Chandos. The current owners are Elizabeth, Lady Ashcombe, widow of Henry Cubitt, 4th Baron Ashcombe, and her two children: Henry Dent-Brocklehurst and Mollie Dent-Brocklehurst. After the death of Lady Ashcombe's first husband Mark Dent-Brocklehurst in 1972, she owns 50 percent of the equity, while her children each own 25 percent. Mark inherited Sudeley in 1949 after the death of his father. His mother decided to stay at the castle though until 1969. It was at this time that Mark and his American-born wife, Elizabeth, decided to open up the castle to the public. It took two years to convert the home into a tourist attraction, but Mark died in 1972, leaving a large amount of both debts and death duties. Lady Ashcombe married Baron Ashcombe, and the couple made major renovations. Lady Ashcombe and her children have since taken over the management of the castle as a visitor attraction. BBC Four featured an investigation into the castle on 27 June 2007 titled Crisis At The Castle. This detailed the turmoil associated with managing the castle within three sets of owners and their families. Closing the castle to the general public on some weekdays meant that visitors were disheartened when embarking on their day trips, and resulted in a dramatic fall in visitor numbers in the three years leading up to the creation of the programme. The castle is sometimes used for high-profile events, such as the 2007 wedding of English actress Elizabeth Hurley to Indian textile heir Arun Nayar, which took place in the private chapel. Katherine Parr Exhibition: Rare copies of original books written by Katherine Parr, the first queen to have her own work published, are displayed in an exhibition to celebrate this remarkable queen. The exhibition also features her love letters to Thomas Seymour and the eyewitness account of the discovery of her body at Sudeley in 1782. These, together with items taken from her tomb, help to illustrate Dr David Starkey's film ‘The Life and Loves of Katherine Parr, Queen of England and Mistress of Sudeley’, which is shown alongside the exhibition. Visitors can also visit Katherine Parr's tomb in St Mary's Church – Sudeley is notable for being the only private castle to have a queen buried in its grounds. Textiles Exhibition: This features a collection of textiles from Sudeley's history displaying textile techniques spanning over 400 years. This exhibition has been described[by whom?] as one of the best in the country and includes a 17th-century stumpwork casket, delicate lace and a Sheldon tapestry. Sudeley is regarded by many as the model for Blandings Castle in the novels by P. G. Wodehouse. The adaptation for BBC television of Wodehouse's Heavy Weather (1995) was filmed there. Sudeley represented Matching Priory, home of Plantagenet Palliser and his wife Lady Glencora, in the 1974 BBC classic serial The Pallisers, based on six novels by Anthony Trollope. Sudeley provided the location for BBC Two show The Great Chelsea Garden Challenge in May 2015. The castle featured on BBC One show Antique Road Trip in September 2015. Sudeley Castle's has nine individual gardens. The centrepiece is the Queens Garden, so named because four of England's queens – Anne Boleyn, Katherine Parr, Lady Jane Grey and Elizabeth I – once admired the hundreds of varieties of roses found in the garden. St Mary's Church, in which Katherine Parr is buried, is bordered by the White Garden, rich with peonies, clematis, roses and tulips, where Katherine and her companion, Lady Jane Grey would have entered the church for daily prayers. The Knot Garden is based on a dress pattern worn by Elizabeth I in a portrait that hangs in the castle. More than 1,200 box hedges form its intricate geometric design, interspersed with coloured gravel and a Moorish mosaic fountain at the centre. The ruins of the 15th-century tithe barn form the centre of a garden, featuring a carp pond surrounded by wisteria, primroses, hollyhocks and cardoons. Other gardens at Sudeley include the Secret Garden, the Mulberry Garden and the Herb Garden Walk. In the Mulberry Garden, country flowers and greenery surrounds the mulberry tree planted in 1865 by Emma Dent. The Herb Garden Walk takes visitors through a fine collection of plants which have been cultivated for their medical properties for thousands of years. The eleven cottages are all named for royal or significant people associated with the castle, and are available all year round. ^ Emma Dent, Annals of Winchcombe and Sudeley(Emma Dent, 1877)p1. ^ Emma Kennedy (June 1, 2012). "Emma's Eccentric Britain: afternoon tea with Lady Ashcombe". The Guardian. ^ "BBC iPlayer - BBC Four". bbc.co.uk. ^ "The Queens' Garden". Retrieved 27 February 2017.